Ever since Kirby Elizabeth Flora McGregor had been a little girl, she had wanted to be rich. She didn't want fancy cars, or fancy houses, she just wanted to be able to have someone cook for her. Kirby hated cooking. Now that she was older, she had to cook for her husband and her mother and her father and her children and she didn't like it one bit. She fixed boiled eggs for breakfast, boiled eggs for lunch and boiled eggs for supper. She didn't like to cook anything at all. One day her husband, Robbie, kissed his wife on the cheek and told her that he was going away for a few days and would return soon. He drove off in his car, leaving Kirby with her parents and children. Kirby and Robbie had five children, Angus, Bonnie, Donald, Gregor and Liston. They were tired of eating eggs all the time too. Most of their friends had roast beef and boiled potatoes and peas for supper and tuna fish sandwiches for lunch. After Robbie left Kirby called her children to the table. She gave each of them a hard boiled egg. The five of them pushed the eggs away. “We don't want eggs any more, Mama. We want watercress and smoked salmon sandwiches for lunch and tonight we want fish and chips for supper,” Bonnie said. They walked away from the table and refused to eat their eggs. When supper time came around, the five hungry children ran to the table, hoping their mama had listened. They were disappointed when she put out five hard boiled eggs for them. The children stood up and pushed the eggs away. “We're not eating those,” Angus said. “We want roast beef,” and the others followed him out of the room. And so it went day after day. Kirby was getting worried about her children not eating and the children were getting very hungry. They went off into the woods to look for berries and nuts. None of the children ate anything for breakfast or lunch and waited anxiously to see what the surprise was their papa had told them about. Papa had them sit around the table. He had Mama put out their best napkins, dishes and cutlery. The doorbell rang. Robbie opened it and in marched five men. 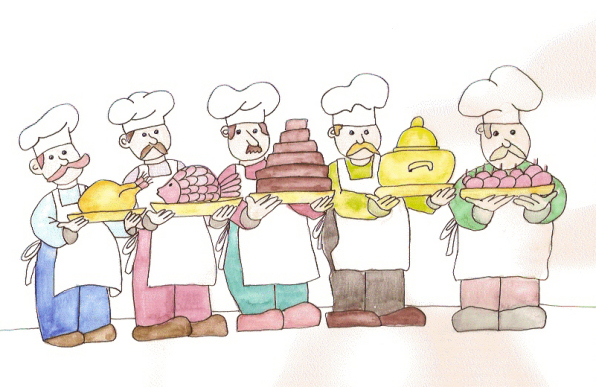 Each was dressed in a chef's hat and wore an apron, and each carried a platter of food. They put the trays down in the center of the table. There was roasted goos, broiled fish, a pot of vegetable soup with ham bones, and a plate of baked apples smothered with caramel and cinnamon. The best thing was the chocolate cake. It was six layers high and covered with thick chocolate. The children feasted like they'd never eaten before. Kirby gobbled down plate after plate. “I know you've always wanted to have your very own cook, so each day one of these chefs will come to our house and cook for the day. We'll have a different one each day so that you'll get a variety.” Robbie hugged his wife. The children hugged their father. For the next two months the chefs came. Each day they baked and boiled and Kirby watched what they were doing. The children ate every meal and looked forward to each with relish. Robbie drooled over the roast beef and laughed a lot more. At first the family was hesitant and looked at each other warily, but when Kirby brought through plates piled high with mince and tatties and haggis and turkey and salmon, they knew their worries were over. There were no more hard boiled eggs served at the McGregor house.